You've probably heard of throat-singing. 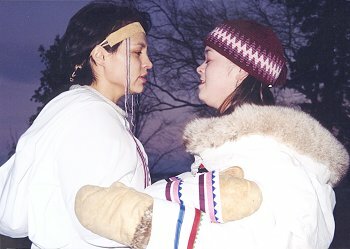 And if you saw the exquisite movie Atanarjuat: Fast Runner, you may remember a scene where two women do the Inuit version of throat-singing, holding each other's forearms and singing face to face. That's a mild introduction to the wonders of Sinaa, the new album from Tanya Tagaq Gillis. Tagaq builds dramatically on the traditional style. While using her (multi-tracked) voice alone as primary instrument for most of Sinaa (which means "edge" in Inuktitut), she veers into experimental realms with call-and response grunts, buzzes, moans, and gasps, sometimes topped with melodic singing. The track "Ancestors" is a collaboration with Bjork, and three tracks feature Txalaparta percussion by Basque group Ugarte Anaiak (review of their new album Ttakunetan coming soon). Curiously, Tagaq didn't grow up hearing this vocal style, and taught herself from old tapes her mother sent her. The world of percussive breathing she creates is dizzying, exhilarating, and a far cry from the melodic Tuvan style of throat-singing. Fans of vocal world music owe it to themselves to check this out. For more background on this fascinating singing style, see this article on Intuit throat singing or check out some traditional singing samples.